Welcome to the new IBC Intel. If you are having trouble logging in, please call our Fairhope location at 251.990.6789 and ask to speak to Nancye or email her. Account Information Please enter your username and password. Register to Access Precision IBC's iNTEL Container Portal Do you feel like you are missing something? Are you able to see a list of your IBCs or run analytical reports? Access to Precision IBC's iNTEL container portal is exactly what you need. Complete a simple form and you will be just a little closer to getting a good handle on your IBC inventory. CALL TODAY TO SEE HOW WE CAN REDUCE YOUR LIQUID PACKAGING COSTS. 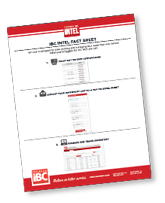 IBC iNTEL: designed to make managing IBCs easier! © copyright 2019 Precision IBC, Inc.